This is the best place to go for full or partial sew ins and all-around hair care. The owner an stylist, Lisa Robinson is an amazing master colorist and stylist. She works with natural and relaxed hair and even makes her own natural hair care products and oils. I had thinning in the front of my hairline and after 6 weeks of hair care by Lisa, I notice thicker, healthier hair with a natural shine! I like going to this salon because its in a secluded local that offers exclusivity and privacy while getting my weave. The customer service is awesome and the environment is appropriate for all ages. I would recommend my stylist to anyone... not to mention she has done hair for high-profile politicians. I bet you never knew it was a weave! The best hair experience ever! Lisa definitely knows what she's doing! The color of the extensions matches perfectly with my daughters hair color. It looks so natural. My daughter was nervous because she's never had extensions before. Lisa definitely went the extra mile to make it a wonderful experience. I searched for months to find a place that could do what Raegan wanted. I went to at least 10 different salons and called 5 or 6 more. After finding Hair Weaves and Extensions online, I called and spoke with Lisa. I told her what Raegan wanted and the texture of her hair. She took the time to explained all of the different ways that the extensions could be done and what she recommended. After our conversation I new this was were we needed to go. Her hair looks beautiful! I would definitely recommend going to Hair Weaves and Extensions to anyone who is looking to have extensions put in. We will definitely be going back! recently decided to change my hairstyle to achieve an easy to maintain, versatile and healthy option for my hair. I've gotten my hair weaved several times before but this time I wanted the works. I found HW&E through multiple Google and Yelp searches. And, after a lot of research about the process I called Lisa and setup my appointment. I was not disappointed. I was so happy with my hair and the entire experience, I've already told my friends to make an appointment. Lisa is a lovely, nice, professional, knowledgeable, highly experienced and talented stylist. Her talents are worth every dime. You get a friendly tutorial on the process and maintenance for your hair from a woman with 20 years of experience and who really cares about what you want. I definitely recommend her services and will be seeing her again. create a custom fit for your unit. It also will be fitted or installed. 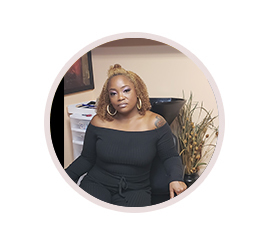 I am a hairstylist and hair extensions specialist (traditional braid and sew weave, microlinks, customized services, netting, lace, hair replacement and units. Expert Stylist ,I have 20 plus years’ experience in the cosmetology field I have done hair as my primary profession for as long as I have been working. I have been doing hair weaving and extensions for just as long. I create and customize my work according to what my client’s specific needs are therefore I ask a lot of questions and I do a lot of listening before any services are rendered. – Hair replacement – units, custom wig making and attachments. My work is customized according to your specific needs. That means there is no one weave fits all here! I listen and create based on your desired look and individual hair concerns. I’m the one you see when you want it done right the first time. I am not the cheapest and by far not the most expensive for my level of expertise, when you come to me, you will get what you pay for and that is high quality top service, guaranteed. For all inquiries please contact us via email at info@hairweavesandextensionsmd.com and we will respond to you within 24–48 hours. You may also leave us a message at 410-744-4900 and we will respond within 24 hours Monday–Friday.